Common English Names: Thornback Ray, Thornback Guitarfish. Family: Platyrhinidae - containing 2 genera and 5 described species. 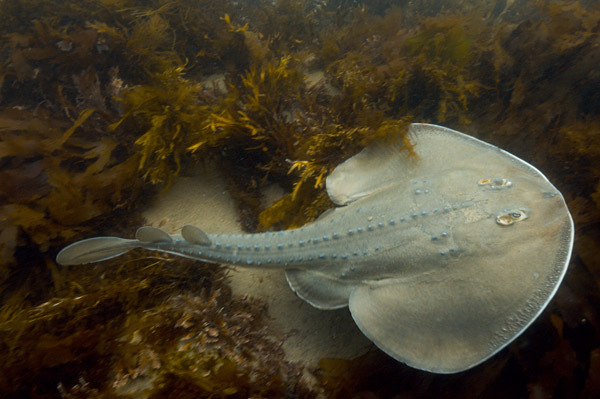 Thornback rays look superficially similar to guitarfishes but thy are actually more closely related to stingrays. Identification: Rounded disc slightly wider than long with rounded anterior edge which has a thin white margin. Three pronounced rows of tubercles (spines) run along back and tail from behind eyes. Tail broad with two well developed, rounded dorsal fins of roughly equal size set close to caudal fin. Oval caudal fin small. Dorsum uniformly light brown to grey. Ventrum pale. Two separate rostral cartilages extend from the skull to the tip of the snout which differentiates thornback rays from guitarfishes which have only one. Habitat: Intertidal inshore waters to 50m. On sand and mud bottoms and occasionally in or around kelp beds. Abundance and distribution: Central California to Baja. Behavior: During the day lays partially buried in sand. Forages for worms, molluscs and crustaceans in the substrate. May be solitary or in groups. Reproduction: Thornback rays are ovoviviparous (yolk sac viviparity). This species is said to be oviparous laying skate egg shaped cases but this needs to be confirmed. Conservation Status: The IUCN lists the California Thornback Ray as LEAST CONCERN. However, although the Thornback Ray is not targeted, it is known to be occasionally caught in commercial and recreational fisheries in United States and in Mexican waters. There is little information available on catches in Mexico, but this species is likely to be taken by inshore fisheries in lagoons on the Baja Pacific coast and probably by shrimp trawls in the Gulf of California. Further information is urgently required given the species' restricted range in Mexico. Photographs: Tajegis Beach, Santa Barbara, California. Similar species: There is only one thornback ray living in this region. The closest sympatric species is the Banded Guitarfish which is easily identifiable by its bold markings and longer, more shark-like tail. Reaction to divers: Generally easy to approach with slow movements. I was able to follow the photographed specimen for most of a dive as it slowly swam around the reef. Diving logistics: Apparently a common species in many bays in southern California but it is often in turbid inshore water where photography is difficult. Try hunting in shallow bays just beyond the surf line for the best chance at sightings. Lawson, J., Carlisle, A.B. & Villavicencio-Garayzar, C.J. 2016. Platyrhinoidis triseriata. The IUCN Red List of Threatened Species 2016: e.T60112A80673588. http://dx.doi.org/10.2305/IUCN.UK.2016-2.RLTS.T60112A80673588.en. Downloaded on 18 October 2017.